This isn’t exactly breaking news! Lavinia Limon stepped down as head of the US Committee for Refugees and Immigrants (USCRI) last October according to a statement by the head of its board of directors. However, it may not have been a voluntary retirement. Someone recently reported to me that she was “forced” out during a period of growing “panic” among the nine federal contractors who are seeing their budgets shrink as refugee arrivals slow. USCRI is presently being led by her longtime sidekick, Eskinder Negash. Lavinia Limon, CEO and President of USCRI has decided to retire from USCRI effective October 13, 2017. The Board appreciates Ms. Limon’s over four decades of service to refugees and immigrants, and her contribution to USCRI, thanks her, and wishes her the best in her future endeavors. A picture worth a thousand words. Limon was Bill Clinton’s Director of ORR and here she is with Mr. Chobani Yogurt. USCRI is the agency bringing refugee labor to Twin Falls, Idaho which benefits globalist Chobani! The Board of Directors has appointed Mr. Eskinder Negash as acting Chief Executive Officer. The Board is currently in the process of conducting a national search, which includes the consideration of Mr. Negash. Mr. Negash, a refugee himself, has devoted his entire distinguished career to addressing the needs of refugees and immigrants. Mr. Negash brings nearly 40 years of experience working on behalf of refugees and immigrants and managing non-profit social service agencies. Prior to joining USCRI, Mr. Negash served as Director of the Office of Refugee Resettlement (ORR), within the Administration of Children and Families, at the U.S. Department of Health and Human Services from 2009-2015. With a budget of over 1.5 billion, the ORR is the largest government-funded refugee resettlement organization in the world. During Mr. Negash’s tenure, the ORR provided essential services to more than 850,000 vulnerable people through its Resettlement Program, Rescue & Restore anti-trafficking campaign, and the Unaccompanied Children’s Program. Additionally, Mr. Negash served as Vice President and Chief Administrative Officer of the International Institute of Los Angeles for 15 years, and the Chief Operating Officer of USCRI from 2002-2009. As we thank Lavinia for her service, say good-bye, and wish her well, please join me in congratulating and supporting Eskinder as he assumes the position of acting Chief Executive Officer of USCRI. If you are a longtime reader of RRW, you know that both Lavinia Limon and Eskinder Negash have been gracing our pages for years. Negash and Limon in happier days! Click here for a huge archive on Limon and here for Negash. I don’t have the time (or patience) for a rundown on their whole careers. However, just a few key bits of information on Limon. She was Bill Clinton’s Director of the Office of Refugee Resettlement and I believe a key player in promoting the idea of refugee labor for BIG MEAT (and eventually BIG YOGURT) that began with Clinton admitting large numbers of Bosnian Muslims for his friends in the Iowa beef industry during her leadership of the Office of Refugee Resettlement in HHS. It is actually a clever scheme: Bring in cheap captive labor ($$$) for your industry pals and wear the white hat of humanitarianism as you do it! Michael Leahy at Breitbart chronicled Limon’s career here (a must read!). As for Negash, he left his post as Director of the ORR (note both of them revolved in and out of government) under strange, never explained, circumstances, see here. Again, I have no idea why this shakeup at USCRI, but it is more evidence that Donald Trump’s refugee policies are breaking up old alliances and power structures in the swamp. You can imagine that they are hurting. They are one of the nine federal contractors*** that is almost completely federally funded. See a discussion of their finances here from last March. I put them (at that time) at about 94% funded by the government (you). Limon was making a largely federally funded salary/related income of over $300,000! Go here to find an USCRI subcontractor office near you. And, this reminds me, speaking of CEOs leaving, I wonder what is happening over at Lutheran Immigration and Refugee Service that was undergoing a shake-up at about the same time, see here. *** These are the nine federal contractors largely funded by you. In parenthesis, after each, is the percentage of their income funded by Congress out of the US Treasury. They are paid by the head to resettle refugees, so as the Trump Administration slows the flow into the country, their budgets are being strained to the breaking point. I’m talking about the US Committee for Refugees and Immigrants (USCRI) which is the contractor responsible for refugees arriving in Twin Falls, Idaho. USCRI is also the agency embroiled in the controversy about bringing Syrian Muslims to Rutland, VT. This is the second in my series on the US State Department’s nine major resettlement contractors***. I told you about Lutheran Immigration and Refugee Service (LIRS) here a couple of days ago. I’ve reported on the nine (really quasi-government agencies) many times over the years, but it’s been about 2 years since I examined each of their financial statements closely, and since we have so many new readers I figured it was time to do it again. Of that $46,560,452 is from government grants (that is you). They had another $3.4 million from various fees and contracts. $1.9 million of that was from those air fare loans I told you about in the post on LIRS. I expect that most of the $3.4 comes from government sources of funding. Run those numbers and you will see this means that 97% of their funds are from federal, state and local tax payers. They couldn’t exist without your money and without Congress shelling it out to them! USCRI’s head honcho is Lavinia Limon (Breitbart told you about her recently). Formerly Bill Clinton’s director of the Office of Refugee Resettlement, she pulled down a salary and related income package of $302,519 in 2014. Another Limon (family member?) collected $159,344. Dear critics, if you find it outrageous that we report this information, remember this: If these were real charitable organizations raising private money I would not care how much they take in or how much they pay their employees, but these are in effect quasi-government agencies and therefore we are entitled to know where our money goes! By way of comparison, go here and see that federal elected officials and judges do not make nearly as much as Ms. Limon because they are accountable to you, she isn’t! Yikes! She makes more than Vice President Joe Biden! Wow! I just went back to the accounting I did using the contractors 2012 Form 990s. Go here and see how much their revenues have jumped in two years! Is USCRI working in your town, go here and find out! The citizens of Rutland, VT who have expressed anger at their mayor for secretly working with a federal refugee resettlement contractor to bring 100 Syrians to the small city, have been busy. They garnered enough signatures on a petition to put the issue on the ballot, but the Mayor and Board of Alderman will have the final say (this Tuesday) on whether it can be put before the voters. Rutland City Alderman Matt Bloomer frets in an op-ed about the really tough decision he has to make on Tuesday. Oh well, isn’t that what leaders have to do—make tough decisions! Not unlike the issue surrounding resettlement of refugees in Twin Falls, Idaho where the controversy has been swirling for years (by the way, it is the same federal contractor making $$$ on a per head basis in Vermont and Idaho—US Committee for Refugees and Immigrants), the citizens in both places are demanding full public debate on the “plans” for the new (Rutland) or continued (Twin Falls) resettlement of third worlders to their communities. But, therein lies the rub, the feds and their contractors have no plans as such. In Athens, GA in 2014 the Democratic Mayor said give me a plan—-where will the refugees work, and live? Does Athens have adequate subsidized housing, can our schools handle large numbers of illiterate children? How about our health department, is it ready for communicable diseases and parasites not often seen in American cities? In other words, she was asking for the feds and the contractor to essentially prepare an economic and social impact statement before giving a green light to the arrival of refugees. I don’t know if things have changed since I learned this past April that Athens still has no resettlement office. Why? My guess is that the US State Department and the Office of Refugee Resettlement(in HHS) don’t want to set a precedent and prepare a plan (with public hearings etc.) because secrecy has worked so well for the last 30 plus years to slip refugees into unsuspecting towns, why change anything now! Sorry to go on so long. To catch up on Rutland, go here and here. Don’t forget our previous post on Tuberculosis in Vermont. Our previous posts on Rutland are here. Then see where one Alderman (Matt Bloomer a Rutland Young Professional) says he plans to vote against placing a referendum on the ballot, here. His biggest fear isn’t who might come into Rutland, what poverty or diseases they might bring in, whether the town could afford the costs necessary to educate the refugee children, whether there are security worries or increased crime, etc. He is worried that, by simply voting, Rutland might get a bad reputation! People from around the state and country will be left with the perception that we are a closed and unfeeling community, rather than the welcoming and compassionate community that we actually are. These misconceptions would be spread at a time when many dedicated people have worked hard to build positive momentum for our community. They would be spread at a time when we’ve recognized the need to proactively recruit people and businesses in order to sustain the size of our community and the quality of life we enjoy. Rutland County legislators from both sides of the aisle have told us that these misconceptions would set back their successful efforts in creating a positive narrative in Montpelier about our county. Readers ask me all the time what can they do to stop this. You can be sure Washington isn’t going to help you. Besides what you are already doing—demanding transparency and thoughtful deliberation—I’ve come to the conclusion that as much as you don’t want to do it, you will have to change your local elected officials, maybe run for public office yourself. Even if you can’t win the first time, you will help raise the issue before voters. Endnote: Has USCRI ever given the Mayor and Aldermen the R & P Abstract which they surely prepared for the US State Department? Just wondering! (See the one they prepared for Reno, here. There is one for Rutland!). Eight regions of the US will be getting taxpayer funded lawyers. The Obama Administration has come up with $9 million of your tax dollars so two of the big nine refugee resettlement contractors*** can get lawyers for some of the ‘Unaccompanied alien children’ who broke into America this summer. Surely what the immigration lawyers will be trying to prove is that the kids are legitimate asylum seekers who can be declared refugees in the full sense of the word making them eligible for all forms of welfare and putting them on the fast track to citizenship. Of course once the kids are declared “refugees” they will be able to bring in the extended family as well! Who says Obama isn’t creating jobs! He is creating more jobs at the US Conference of Catholic Bishops special lawyers’ service and at the US Committee for Refugees and Immigrants (USCRI is already funded 99% by you!). And, he is putting to work potentially hundreds of immigration lawyers who are pouring out of US law schools and looking for work (there is a glut of lawyers these days as any new law school grad will tell you). From the Washington Times (hat tip: Erich). Will the gutless wonders in Congress do anything about it? The Obama administration will pay $9 million over the next two years to give taxpayer-funded attorneys to some of the illegal immigrant children who have surged across the U.S. border this year, the Health and Human Services Department said Tuesday. About 2,600 immigrants will be able to be represented by lawyers thanks to the funds, which were awarded in two grants to the U.S. Conference of Catholic Bishops and the U.S. Committee for Refugees and Immigrants, according to a notice to be published in the Federal Register on Thursday. Advocates cheered the decision, which they’d been demanding for months, saying it will not only help the children get a fair hearing on asylum claims, but it will also make the court proceedings go faster, which will end up saving the government money. But administration critics in Congress said the move could violate federal law and will most likely prolong illegal immigrants’ time in the U.S., encouraging more children to make the dangerous crossing. The administration’s move marks another effort to circumvent Congress. Mr. Obama had requested $15 million to provide lawyers for the children in his emergency spending request earlier this summer, but Congress left town without approving the money. The contractors will decide which children will be served, but there will be eight targeted areas in the US. The Washington metropolitan region, with its high population of Central American immigrants, has taken an outsize number of the children, so it’s not surprising the Baltimore/Arlington region is one of eight areas that will get the money for lawyers. The other seven are: Los Angeles, Houston, Miami, Dallas, Memphis, Tennessee, New Orleans and Phoenix. All of our coverage of the Unaccompanied minors issue is here. *** Two of the nine contractors hit pay dirt! These are no longer non-profits, they are quasi-government agencies! Lavinia Limon is the CEO of the US Committee for Refugees and Immigrants, known in the refugee industry as USCRI. Below, published at the Budapest Business Journal (of all places) is her six-point prescription for what the Obama Administration should do to save the ‘unaccompanied alien children’ (child “refugees” she calls them) because how we respond will “define us as a Nation,” she says. Revolving door! Doing well by doing good! It’s mentioned in her bio at the end of this opinion piece, but keep in mind she is one of several refugee contractors who have moved in and out of the revolving door from ‘non-profit’ contractor to government giver-of-grants and then back out again. She was Bill Clinton’s head of the Office of Refugee Resettlement (in HHS) after first working in a ‘non-profit’ resettlement agency, and now she heads up the ‘non-profit’ group USCRI where she seeks grants from her former USCRI VP (Eskinder Negash) who now heads Obama’s Office of Refugee Resettlement. Did you get that? So, let’s see how the inflationary times are treating USCRI and her salary! (I’m going to get to her prescription for handling the southern border invasion, but this is too good!). In 2006 her salary and other compensation was $195,478. That is up about $20,000 from the previous couple of years. First, you need to know that in its 2013 Form 990, USCRI took in $35,676,146 and $35,429,570 came from government grants (page 9)—that is, 99% of their funds are from you—the US taxpayer! (much worse than any contractor*** we have reviewed so far). They apparently make virtually no effort to raise private funds in what was supposed to be a public-private partnership when the Refugee Act of 1980 was signed into law by Jimmy Carter. So what is Ms. Limon’s salary today? Drum roll please! On page 7 of that Form 990 we learn that Lavinia Limon is making more than the Vice President of the United States whom she ever-so-gently disparages in her op-ed at the Budapest Journal. Her salary from USCRI and other sources related to her work there is $289,192. It went up 32% since 2006! Has your salary increased that much over so short a time? If she were in the legitimate private sector, then what they pay is none of our business, but she is essentially a government employee, so we have every right to blow our stacks! Family business? One Peter Limon is listed in that Form 990 as well pulling down a salary of $115,878 and $23,991 from related income. Consider all of that information when you read this opinion-piece (that you paid for!). 1. Respect families by allowing parents from El Salvador and Honduras who reside legally in the United States under Temporary Protected Status to apply for their minor children to reunite. The children’s status would then be linked to their parents. This would immediately reduce immigration court backlogs, and would apply to an estimated 30–40 percent of the children surrendering at the border. 2. Keep kids out of the courtrooms by instituting a Children’s Corps based on the Asylum Officer Corps model. Officers will have training in child-sensitive interview techniques and Best Interest Determination standards, and will determine whether a child is eligible for legal relief. This will move the adjudication process from an adversarial judicial process to an administrative process for most children. Reports indicate that 40–60 percent of these children may be eligible for legal protection. 3. Help children avoid the dangerous journey by allowing them to apply for refugee status from their home country. We’ve previously used this process so that Soviet Jews, Vietnamese, and Cubans could avoid life-threatening escapes. Additionally, other North and South American countries may be willing to accept the children for resettlement. 4. Engage the UN Refugee Agency (UNHCR) to determine international protection needs using its well-established procedures. The UNHCR could then refer cases to the U.S. Department of State for further interviewing and approval before resettlement in the United States, and possibly other countries. 5. Forgive the children by granting Children’s Protected Status (CPS) to all unaccompanied children who have already been brought into custody. We used this approach with Cubans and Haitians who arrived illegally in 1980. The government could announce a cut-off date after which new arrivals would be subject to expedited removal. Granting CPS will relieve the government of the burden and cost of adjudicating the cases of the thousands of unaccompanied minors who are at the border, and will increase the Department of Homeland Security’s capacity to handle other immigration cases. 6. Introduce hope by creating a Regulated Entry Procedure for 10,000 unaccompanied immigrant children per year per country from Honduras, El Salvador, and Guatemala. As precedent, a lottery system has allowed 20,000 Cubans to enter the United States annually for the past 34 years. The children would enter the United States legally through a process managed and regulated by the U.S. government. I love the United States, and I have high expectations for its international behavior and reputation. We can do better, and I commit to being part of the solution. Our complete archive on ‘unaccompanied minors’ goes back several years, click here for all of those posts. USCRI: Hiring a refugee (instead of an American) is good for a business’s bottom line! Geeez! I had no idea that they had the audacity to spell out on their website how hiring a refugee trumps hiring an American, and the employment service this refugee contractor offers is FREE! First, a little background. USCRI stands for US Committee for Refugees and Immigrants. It is one of nine major federal refugee contractors. 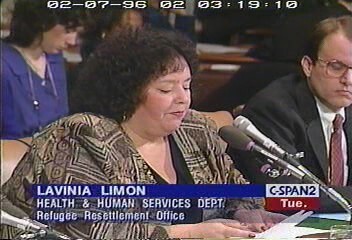 It’s head honcho is Lavinia Limon who coincidentally headed Bill Clinton’s Office of Refugee Resettlement (ORR) when Clinton brought Bosnians to Iowa for laborers for the meatpackers (just mentioned it here yesterday when I told you about Columbus Junction, Iowa.) Type ‘Lavinia Limon’ into our search function for more. As Limon revolved out the ORR door to her job as a federal contractor, USCRI’s Veep, Eskinder Negash, revolved in and now heads the Office of Refugee Resettlement in the Department of Health and Human Resources which gives out grants to USCRI. Handy huh! And USCRI sure does get the federal grants! According to the most recent Form 990 (p.9) available for Ms. Limon’s USCRI they received 94% of their $35 million plus income from you—the taxpayer. So much for that public-private partnership mumbo-jumbo! So, their services might be FREE to businesses, but not FREE to you! Refugee workers improve your bottom line. Strengthened by adversity, refugees make capable, resilient, and loyal employees [Read desperate and can’t go home—ed]. USCRI’s partner agencies all over the United States can match your business with the perfect refugee employee(s)! Our partner agencies offer comprehensive services that ensure employer satisfaction and high employee retention rates. Best of all, services are FREE. Skills: Refugees showcase a variety of employable skills. Refugees are doctors, nurses, small business owners, farmers, construction workers, graphic designers, tailors, cooks, and more. Most refugees speak several languages. Some refugees hold Master’s Degrees; others are expert farmers and artisans. If you’re looking for a skilled employee, USCRI can match you with a qualified refugee. Strong work ethic, high retention rates: Refugees who come to the United States want to regain self-sufficiency and economic stability for their families. Strengthened by their experiences, they make capable, resilient, and loyal employees. Positive economic and community impact: Refugees are new Americans and they contribute to the economy by spending locally, living locally, and paying taxes. Hiring refugees promotes self-sufficiency by strengthening families and communities. They are hard-working, loyal employees who will improve your bottom line, while improving their own lives. Tax incentives: Some businesses qualify for tax incentives when they hire resettled refugees. For more information, visit the Department of Labor website or talk to your local DOL representative. Tax incentives to hire refugees before Americans? You betcha! Not that long ago a foreman on a factory production line told me that her company rotated immigrants through the business while turning Americans away at the door every day! Related! See the Center for Immigration Studies latest report-–it is not true that there are jobs Americans won’t do! Americans will do any job! Also related! USCRI supports the Gang of Eight bill in the US Senate which will add another 11 million immigrant workers to compete with Americans and with refugees for scarce jobs, go figure!